This entry was posted on April 24, 2013 by admin. 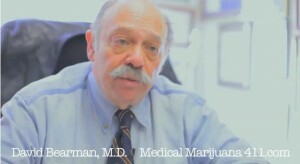 Earlier you mentioned that maybe I was opposed to medical marijuana and I said no I was just dubious. And I certainly was dubious about the use of cannabis in treating ADD/ ADHD. But that was because I didnt know anything and when I looked into it, I found out that there were at least 40 papers written before 2000 dealing with the endo-cannabinioid system, cannabis, and ADD/ ADHD. And that as early as 1998 efforts had been made in Oregon to add ADD/ ADHD to the list of conditions for which cannabis was appropriate or legal in the state of Oregon. I began to have people mention that they were able to focus and concentrate more with cannabis. I had people tell me that their grades went from Ds and Fs to As and Bs when they started using marijuana in Jr High School. I had one patient come in and attributed their graduating from the maritime academy to smoking marijuana. And another person who said that they were able to get their PHD as a result of smoking marijuana. I started looking into this and found that there were hundreds of research studies that had been done which provided some of the information as to why this might work. The reason that it probably works is that cannabis is important in terms of retrograde inhibition and retrograde inhabissson is the way of modulating the speed of neuro transmission. Its normal. If you dont have enough cannabinoids is that your neuro transmission is too rapid. If you have a rapid assault if you will on the cerebral cortex of a substantial number of ideas, concepts, sensory input, then it may be difficult for the cerebral cortex to focus or concentrate. But if you slow these down, the neural impulses down, by a few nanoseconds then youre gonna give the cerebral cortex more of an opportunity to focus and concentrate because your gonna have neural impulses moving more slowly and youll probably have fewer neural impulses. There was an article that appeared in Scientific American in December 2004 written by Elger Nichol. I had the good fortune of attending a conference and be able to chat with Elger about retrograde inhabision and about the way cannabis worked in terms of Attention Deficit Disorder (ADD) and he told me that I was more or less in the ballpark. After all hes a researcher and Im a clinician so theres not always a perfect exchange of information between clinicians and researchers. But in this case I feel as though I am close enough to having a good understanding. Furthermore in addition to Elger, there is a researcher at UC Irvine, Daniele Piomelli. Piomelli, has invented six or seven substances that interfere with the bodys own metabolism of its own cannabinoids. And he feels that by increasing the cannabinoids in the brain that it is useful to treating panic attacks, attention deficit disorder, turrets syndrome and bi-polar disorder. And I think much of the way in which cannabis works can be explained by the phenomenon of retrograde inhibition. And whats happening there is that the cannabis is causing more dopamine to be available. It is the dopamine that actually causes, actually facilitates the retrograde inhibition. What cannabis does, it competes with dopamine for dopamine binding sites on dopamine transporter. And if you get enough cannabis, it fills up the binding sites on the dopamine transporter or at least a lot of them, the dopamine cant get in you now have more dopamine you have more retrograde inhibition, you have slower speed of neuro transmission, and you have better ability to focus and concentrate.